Many investors don’t think of mining stocks as dividend growth companies, because of their lower dividend yields. The sector has largely been overlooked by the Canadian dividend investing crowd. Yet these are “dividend growth” companies with strong balance sheets. They have recently raised their dividends, and have more potential for share price increase. Take PotashCorp (POT) as an example, which recently raised its dividend by a whopping 33%. By avoiding the lower-yield mining companies, many investors may be giving up a “golden” opportunity for future growth, when the resource sector rebounds. The Canadian mining sector also has companies which are trading at their two and three year lows. In a rising market where many stalwart blue-chips are trading at their 52 week highs, there may indeed be opportunity in this beaten up sector. This is a sector that has been on my watch list for a few months, and I am ready to make a move. These aren’t penny-stocks, or junior mining companies, but giant multi-billion dollar companies with global reach. The majority of these Canadian mining companies are also “interlisted” on the NYSE as well as the TSX. Three Canadian mining companies are now on my watch list: Goldcorp Inc. (G), Teck Resources (TCK), and Potash Corp. (POT). I’ve also included Barrick Gold (ABX) and Agrium (AGU) for comparative purposes. As discussed in the conclusion, Barrick is now off my watch list. Table-1 below gives the basic fundamentals and dividend info. Goldcorp (GG) is the world’s second largest Gold producer, in terms of market cap, and is worth over 28 billion dollars. In terms of productions tonnes, it is the world’s fourth largest, with an annual output of 71 production tonnes in 2011 (see Wikipedia). Goldcorp has the lowest dividend yield of the five Canadian mining stocks I first perused, with a dividend yield of only 1.78%. However Goldcorp has a phenomenal balance sheet, with a debt-to-equity ratio of only 3.4%. This is a low debt level for any company, and Goldcorp has continually shown itself to be a well run and managed company. Goldcorp also has a high profit margin at 32.1%, and low dividend payout ratio (DPR) of only 28.8%. This is a great combination. So there is more than enough room to grow the dividend. Goldcorp also has the benefit of being a monthly dividend payer. Goldcorp would have made the top of my list, if it were not for the lower yield. Goldcorp is “interlisted” on both the TSX as G, and the NYSE as GG. The company is also trading near its three year lows. Potash Corp. of Saskatchewan (POT) is the world’s largest supplier of potash, producing 20% of the world’s supply. It is also the world’s largest fertilizer producer, as well as the world’s third largest phosphate and nitrogen supplier. Potash is an important resource on the global marketplace, as it’s predominately used in agriculture for fertilizer. In August 2010, PotashCorp became well known after a hostile takeover attempt by Australian mining giant BHP Billiton. On August 19th, 2010, shares of Potash Corp. were trading at $52.35 per share (split adjusted) up over 36% from $38.25 per share only a few days earlier. On November 3rd, 2010, The Government of Canada announced that it was blocking the BHP bid, and BHP withdrew its takeover. A few months following in February 2011, Potash Corp. commenced a 3:1 split. Today, in terms of the split-adjusted price, PotashCorp is trading near its two year lows. PotashCorp also trades on the NYSE as POT. PotashCorp has an excellent balance sheet and great fundamentals. This is a 34 billion dollar company, with a healthy 2.9% dividend yield. PotashCorp is also a “dividend growth” company, recently raising its dividend by 33%, from 0.21 cents to 0.28 cents per share paid quarterly. PotashCorp has a healthy profit margin of 27.9%, a low dividend payout ratio (DPR) of 42.9%, and a moderate to low debt to equity ratio of 41.1%. PotashCorp has excellent fundamentals, and of the three stocks is at the top of my list (only because the yield is higher than Goldcorp). Teck resources (TCK) is Canada’s largest diversified resources company, with a market cap over 18.4 billion dollars. It is focused on the extraction and refinement of copper, steelmaking coal, and zinc. To a large degree Teck is influenced by China and the global economy, since much of its exports and sales are from steelmaking coal. A slowing demand has resulted in the lower share price for Teck. Teck has a smaller profit margin than Goldcorp or PotashCorp, at 7.84%. But it has a reasonable debt-to-equity ratio of 40% and a similar dividend payout ratio (DPR) of 40.5%. It has a current dividend yield of 2.86%. Teck is also a “dividend growth” company, and recently raised its dividend by 12.5%. 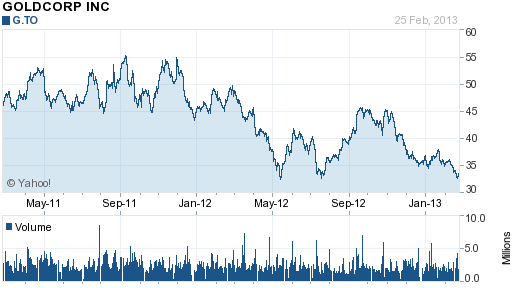 Back in January 2011, Teck Resources (TCK) was trading over $61 per share. Today Teck trades at $31.41 per share, off nearly 50% from its peak. Teck Resources is currently trading at its two year lows. It trades on the NYSE as TCK. I had originally included Barrick Gold (ABX) in my initial analysis, but quickly removed Barrick with its negative earnings and increasing debt load (Table 1). In a recent Globe and Mail post Has Barrick Bottomed?, Lou Schizas looked at the problems plaguing the company. In 2011 ABX paid $7.3-billion to acquire Equinox Minerals, the results of which caused the company to write down the acquisition. Then CEO Aaron Regent was promptly ousted. Barrick also has the highest debt levels of the five mining companies I initially compared, and is off my watch list until things improve. Agrium (AGU) is a well run company, and more diversified than Potash Corp. I felt Potash was the better buy with its higher profit margin, higher yield, and lower price point. Agrium has great fundamentals though, even with its lower profit margin, and is worth keeping an eye on for the future. I’ve settled on PotashCorp (POT) and Goldcorp (G) as the two companies I would like to purchase in the near term. Teck Resources (TCK) remains on my watch list and may be a purchase later in the year. Readers what’s your take? Are you interested in Canadian mining stocks? Disclaimer: I do not currently own any of the companies mentioned. I intend to purchase G, POT, and TCK-B in the future. Please note this article is not intended as a buy recommendation or as professional investment advice. Please do your own research, or consult with your financial advisor, and make sure the companies you purchase suit your investment objectives.